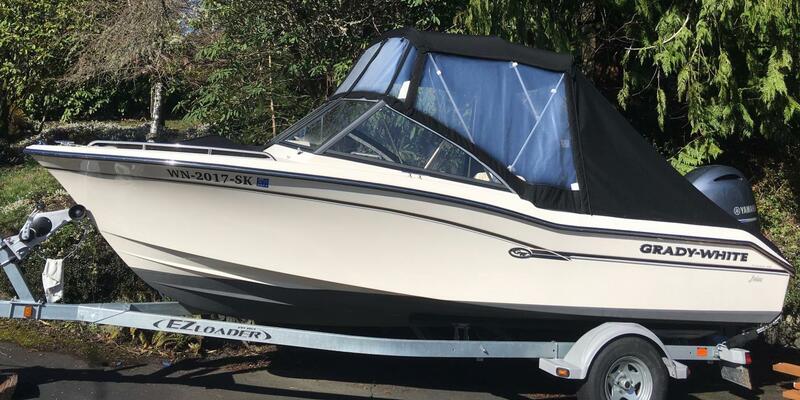 2016 Grady-White Freedom 192 Absolutely wonderful boat with EZ load trailer. Perfect condition. Great - and safe - for rugged offshore sport fishing, skiing and wakeboarding, or just getting anywhere with ease for entire family. Powered by Yamaha F150XB 25" 4 stroke with top speed at 44.5 mph, economical and fun cruising at 26.4 mph. Hydraulic steering from a deluxe helm chair. Carries 8 and gear with ease. Cruising bimini with inventive cover and storage for trailering. 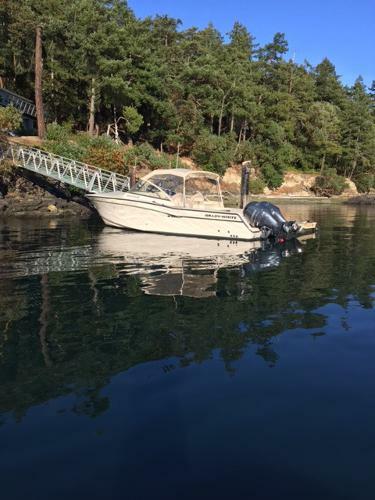 Added features include port sleeper seat; raw water wash down; vista top, front, side, and back drop canvas; bow cover and inboard canvas in walkway; Simrad GO7 chart plotter, depth sounder, and fish finder; dual battery system. Excellent Grady-White display and software that tracks systems and engine use well. Bottom paint with barrier coating great extra! Automatic bilge pump. Cockpit toe rails. Self-bailing cockpit with two drains. 62-gallon fuel tank. Swim platform and ladder. 4 rod holders. 2 aft seats. Extensive lockable storage with 44-quart insulated icebox with external drain; extra 52-quart cooler with matching cushion on top. Port and starboard bow box cushions, windshield wiper on starboard side. Safety equipment including anchor, rode, all required navigational lights, fire extinguisher, and life jackets. Engine recently winterized and serviced. 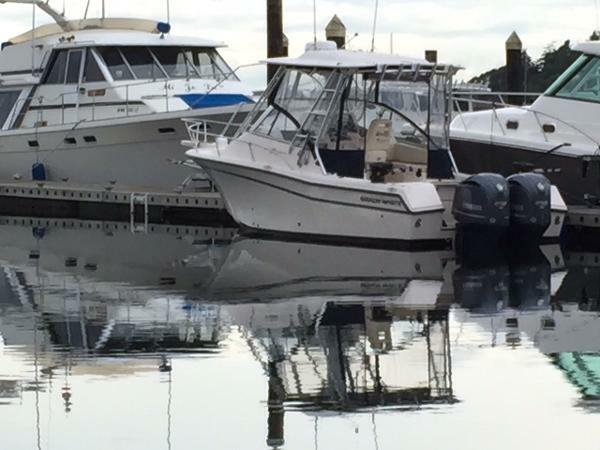 Transferable warranties in place for engine and boat. 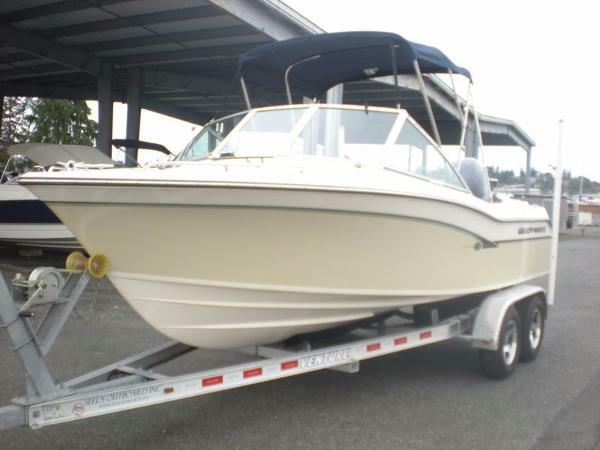 2013 Grady-White Freedom 307 POWERED BY TWIN YAMAHA F350'SVERY CLEAN BOAT!!! 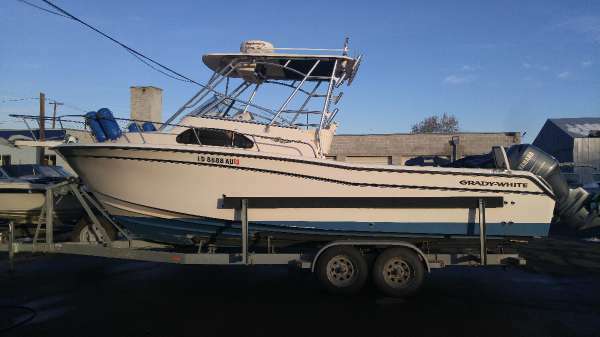 1988 Grady 226 Seafarer with a boat load of options. . .this thing is a real fish killer. Mostly fishing with friends at this point and looking to pass this on to the next one who needs a good open water fishing vessel. Hasn't been used much the past few years. Currently out of the water on the trailer. Maintenance records on the engines. 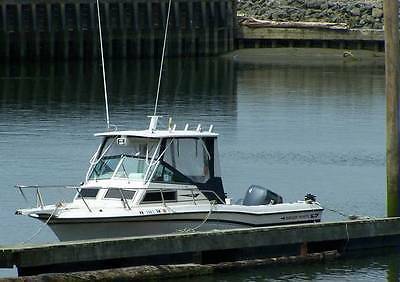 boat is located near Port Townsend, Washington. Dimensions LOA: 22 ft 0 in Beam: 8 ft 0 in Displacement: 3000 Lbs Engines Primary Engine Brand: Yahmaha Engine Total Power: 225 HP Engine Model: V225 TLRW Two stroke Year Built: 1998 Engine Hours: 450 Secondary Engine Brand: Yahmaha kicker Engine Total Power: 9.9 HP Engine Model: 4 Stroke Year Built: 1998 Engine Hours: very few Cuddy Cabin • Berth-Forward V-Berth w/shelves • Opening hatch for ventilation • Opening Ports • Dome light • Lockable Bi-fold companionway door...fresh varnish. • (4) Interior Rod storage holders • Porta-Potti • Storage-Under berth compartments Deck & Hull • Optional Hardtop with full enclosure. This makes for an extremely nice ride during the cooler months of the year. • The cockpit has a build-in livewell and fish box, and cooler. The cockpit area is huge on this model Grady and built in. • Windshield Wiper • Bow Pulpit w/Danforth anchor • 200'+ line w/chain leader • Anchor roller • Anchor locker w/rode storage • Livewell • 28 rod holders • Rocket launcher on the back • SS Bow rail • SS Deck hardware • SS Grab rails • Nonskid recessed walk-around • Self-bailing cockpit w/cockpit drains • Exterior hull is in great shape and shows very well. Decals have some nicks, etc. Cockpit and cabin are in very good shape with just a few small cracks or dings in the fiberglass but nothing that you would not expect to find on boat of this vintage. Mechanical and Electrical • Hydraulic steering • SS Steering Wheel • LENCO Hydraulic trim tabs and indicator • Sea surface temp gauge • 2 Batteries • Battery select switch Electronics • Wired for Lawrance multifunction displays • NMEA 200 wired • Ritchie compass • Sea surface temp gauge. • Cockpit lights • Lockable helm station radio box Trailer • 2005 Tandem axle 30 foot trailer • Disc brakes • LED lights. • Bunks (new style) instead of rollers to support the boat better. Misc Lines, fenders, manuals and spare props included in the sale. Boat was mostly for Halibut fishing. Also caught Salmon, Tuna and Ling Cod with this boat. When it's been used for Halibut it's gone 30-50 miles off the coast. 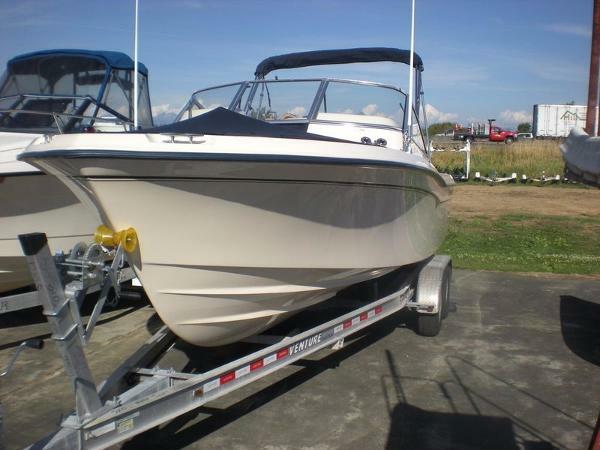 Price: Now $18,300 Boat located near Port Townsend, Wa Can show most weekends. Call (818.279.120one) Buyer is responsible for transport, a $500 within 24 hours via paypal, and complete payment and pickup within a week unless otherwise arranged in advance. 2000 Grady-White 265 Express Repowered with twin F250 DEC controlled motors and Command Link Plus engine gauges! Freshly installed ALL NEW 7612 Garmin Sounder/GPS system with new Garmin dome radar. Electronics flush mounted in a custom helm panel. Fusion radio installed and integrated into new electronics package. Custom canvas including tempered glass insert above windshield with built in second wiper. Rigged with Scotty Electric downriggers. Painted Steel Trailer Included!